Known for his virtuosity and probing musicianship, Grammy award-winning violinist James Ehnes is one of the foremost violinists of his generation. He has performed in over 35 countries, appearing regularly in the world’s great concert halls with the most celebrated orchestras and conductors. Pianist Andrew Armstrong has dazzled audiences throughout the world, including performances at Alice Tully Hall, Carnegie Hall and the Kennedy Center. Recent and future orchestral highlights include the MET Orchestra at Carnegie Hall with Noseda, London Symphony with Alsop, Gewandhausorchester Leipzig with Shelley, Vienna Symphony with Elder, New York Philharmonic with Mena, Deutsches Symphonie-Orchester Berlin with Slatkin, Chicago Symphony with Gaffigan, Orchestre National de France with Gardner, Cleveland, Philadelphia and Boston Symphony Orchestras with Denève, Frankfurt Radio Symphony with Orozco-Estrada, Pittsburgh Symphony with Honeck, Minnesota Orchestras with Vänskä, Sydney Symphony with Søndergård, Hong Kong Philharmonic with van Zweden and Oslo Philharmonic with Petrenko. In 2017, Ehnes premiered the Aaron-Jay Kernis Violin Concerto with the Toronto, Seattle and Dallas Symphony Orchestras; future performances of the piece include with the Deutsches Symphonie-Orchester and Melbourne Symphony Orchestra. Ehnes was awarded the 2017 Royal Philharmonic Society Award in the Instrumentalist category. Alongside his concerto work, James Ehnes maintains a busy recital schedule. He performs regularly at the Wigmore Hall, Carnegie Hall, Symphony Center Chicago, Amsterdam Concertgebouw, Ravinia, Montreux, Chaise-Dieu, the White Nights Festival in St Petersburg, Edinburgh Festival, Festival de Pâques in Aix, and in 2009 he made a sensational debut at the Salzburg Festival performing the Paganini Caprices. 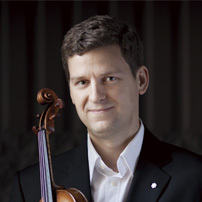 In 2016, Ehnes undertook a cross-Canada recital tour, performing in each of the country’s provinces and territories, to celebrate his 40th birthday. As a chamber musician, he has collaborated with leading artists such as Andsnes, Lortie, Vogler and Yo-Yo Ma. In summer 2017, Ehnes makes his debut at the Verbier Festival performing with artists including Antonio Pappano, Yuja Wang, Nikolaï Lugansky, Antoine Tamestit and Mischa Maisky, In 2010, he formally established the Ehnes Quartet, with whom he has performed in Europe at venues including the Wigmore Hall, Auditorium du Louvre in Paris and Théâtre du Jeu de Paume in Aix, amongst others. 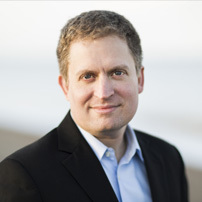 Ehnes is the Artistic Director of the Seattle Chamber Music Society. Ehnes has an extensive discography and has won many awards for his recordings including a Gramophone Award for his live recording of the Elgar Concerto with Sir Andrew Davis and the Philharmonia Orchestra. His recording of the Korngold, Barber and Walton violin concertos won a Grammy Award for ‘Best Instrumental Soloist Performance’ and a JUNO award for ‘Best Classical Album of the Year’. His recording of the Paganini Caprices earned him universal praise, with Diapason writing of the disc, “Ehnes confirms the predictions of Erick Friedman, eminent student of Heifetz: ‘there is only one like him born every hundred years’.” Ehnes’s recent recording of the Bartók Concerti was nominated for a Gramophone Award in the Concerto category. Recent releases include concertos by Britten, Shostakovich, Prokofiev and Khachaturian and sonatas by Debussy, Elgar and Respighi, and his recording of the Beethoven Violin Concerto with the Royal Liverpool Philharmonic Orchestra and Andrew Manze was released in October 2017 (Onyx Classics). Praised by critics for his passionate expression and dazzling technique, pianist Andrew Armstrong has delighted audiences around the world. He has appeared in solo recitals and with orchestras in Asia, Europe, Latin America, and the United States and in chamber music with violinist James Ehnes, cellist Robert deMaine, the Elias, Alexander, American and Manhattan String Quartets, as a member of the Caramoor Virtuosi, the Jupiter Symphony Chamber Players, and Amelia Piano Trio. His solo recordings feature works by Rachmaninov, Mussorgsky, Chopin, Liszt, Debussy, and the world premiere recording of Bielawa’s Wait for piano & drone (Cordelia Records). He has also released several award-winning recordings with his longtime recital partner James Ehnes including works by Bartók, Prokofiev, Tartini, Leclair, Franck, and Strauss. Andrew is devoted to outreach programs and playing for children. In addition to his many concerts, his performances are heard regularly on National Public Radio and WQXR, New York City’s premier classical music station. Concession ticket holders are required to present acceptable proof of identity / age for entry. 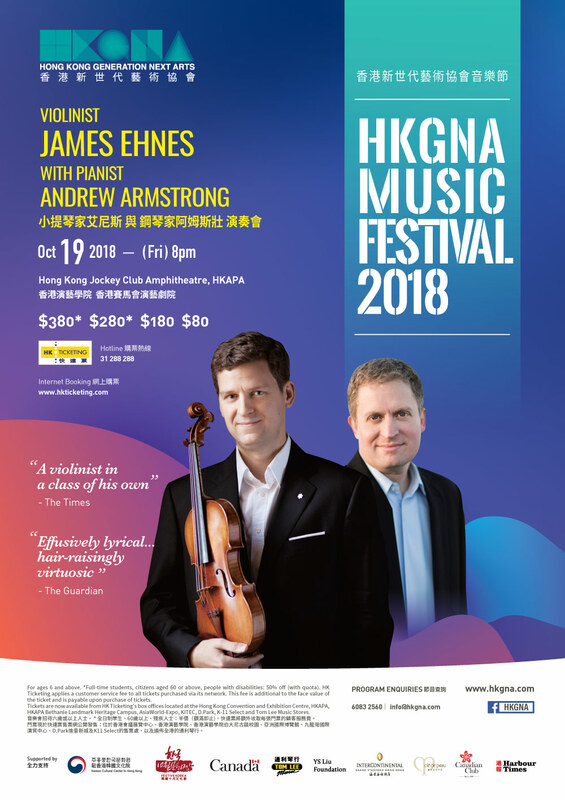 Tickets are now available from HK Ticketing’s box offices located at the Hong Kong Convention and Exhibition Centre, HKAPA, HKAPA Bethanie Landmark Heritage Campus, AsiaWorld-Expo, KITEC, D.Park, K-11 Select and Tom Lee Music Stores.